I use the term "food" very loosely in this instance. Today I am reviewing Post's New! Poppin' Pebbles. 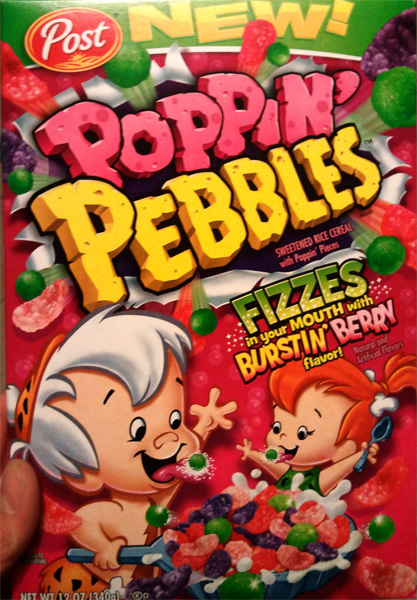 It's a sweetened rice cereal with Poppin' Pieces which FIZZES in your MOUTH with BURSTIN' BERRY flavor! All of this is on the front of the box. Now, I'm not really a cereal eater. It's been few and far in between my last bowl of cereal. Every now and again I'll get a hankering for some Life or Corn Pops or Fruity Pebbles or some other cereal from my childhood. But it's been a while since I've walked down the cereal aisle looking at all of the variations of [processed GMO corn with added sugars and colors]. This new flavor of children's cereal actually came to my attention via National Public Radio's website, NPR.org. Surprising, right? As soon as I saw it, though, I knew I had to have it. Sometimes it's difficult to find the "trend food" that is blowing up corners of the internet. This was not difficult to find. I was at Target and they had it. It was like $2.38 for a box, or some weird price close to that. I was there to buy socks, but I guess no one still sells wool boot socks in the middle of winter. They're already starting to merchandise the spring gear. Anyways, with cereal acquired, I grab a couple other items and head up to the checkout to get my credit card information stolen again. It's a smallish narrow box. I would guess there about 4ish man-sized servings inside. The bag inside is the plastic that rips not along the seam, but down the side when opened. So like, after a pour you lift it up and since there isn't a neat edge, a couple pebbles don't make it back into the sack and fall down into the sides of the box. There are words or a puzzle or sweepstakes or something inside the box. I'll update when I finish the cereal and rip the box inside out. 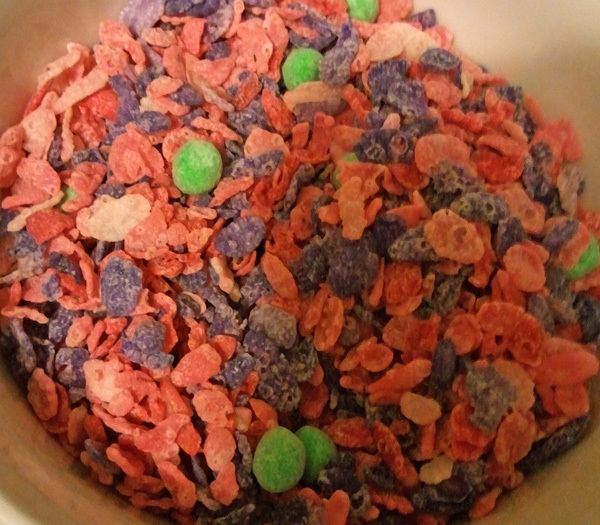 The cereal is normal fruity pebbles with a scattering of green balls. They look a lot like the dehydrated wasabi peas, actually. Maybe fun for kids that don't eat those, but confusing-looking for adult taste-buds. I added 2% milk to a level just beneath the top layer, where the top layer stayed dry. Back in the college I had a bowl or two of Nati Pebbles. I forget the context, like did I declare "Natty Light is good with anything!" or if it happened just because, hey, college. (It's Fruity Pebbles with Natural Light beer instead of milk, if you're still wondering). It wasn't delicious. It wasn't terrible, either. Anyways, there's some pressure to try Natty Poppin' Pebbles, but I am scared it might end up like Mentos and Diet Pepsi. I mean, there are all of those urban legends true stories about kids that down a bag of Pop Rocks then chug a Sprite and their stomachs explode. It's true--look it up! Before adding milk, I stuck one of the Poppin' Balls in my mouth. I wanted to taste it alone. By itself, I mean; though I was alone too--you'd have to be so so alone to make this dinner. The Poppin' Balls are quite literally Pop Rocks. I don't know if they are brand name Pop Rocks, but it is the exact same candy. And they are suspended in a sweat corn meal ball that is probably coated with something to keep the Pop Rocks dry until they are in your mouth. I listened to the cereal after pouring in the milk. There was nothing going on. It's not like Rice Krispies where you hear a chorus of dying elves snapping, krackling, and popping. Silent. So yeah, the Poppin' Balls are coated in something to keep them from exploding before getting into your mouth. The ratio and distribution was good too. I got a ball in enough bites that I didn't feel like I wasn't getting enough balls in my mouth. Also, I wasn't overwhelmed by having too many balls in my mouth. It was just the right amount of balls in my mouth. The food scientists at Post did a good job at Goldilocksing the Poppin' Balls in this cereal. I am a child of the 80s/90s. So I know a thing or two when it comes to Pop Rocks. My concern was in regards to the Pop Rocks being encased inside the wasabi peas. The best way to eat Pop Rocks is not to bite them, but to let them rest on your tongue with your mouth held open. This is an indisputable fact. But in this cereal, besides the Pop Rocks being encased in the green balls, the mouth is also tasked with chewing and swallowing the Fruity Pebbles. Sometimes in life, you just have to let go. Not everything is in your control. You have to put your faith in something. Trust the world. Trust Post's food scientists. So I discarded my inhibitions--throwing caution to the wind--and ate it like a normal bowl of cereal. Let me tell you, here is why food scientists earn their paychecks. The sweetened corn meal of the Poppin' Balls becomes a paste that compacts into your teeth, virtually embedding the Pop Rocks into what have no doubt already started to become cavities. Like little miners blasting tiny sticks of dynamite, the Poppin' Balls get to work blasting away at teeth. My mouth was filled with fireworks. I could taste it in the colors of the Pebbles. I could feel it exploding in my teeth. It was a full sensory experience. It was exciting. No cereal has ever done this. Needless to say, my concerns had been assuaged. I poured a second bowl immediately. Is Poppin' Pebbles the Best Cereal on the Market? In a word, no. Yes it was delicious. Yes it was exciting. But it became significantly less fun when the stomach pains started. It was less fun when the sugar shakes set in. Cereal isn't about fun. I guess it's not really about nutrition either. Cereal is what they feed to livestock. Humans should not eat cereal. Post has taken what is already a sweet cereal and added candy. Has innovation ended? Have they run out of shapes of marshmallows to add to cereals that they're now just straight-up, flat-out, adding candy? When can I eat a gummy bears cereal? I can in no way recommend this cereal for anything other than entertainment value, consumed by responsible adults. Here's the other thing about Fruity Pebbles, Fruit Loops, et. al. Back in the good old days either no one cared or the technology didn't exist to protect the cereal from the milk. If you didn't consume the cereal at the correct pace, it would turn to mush and dissolve into the milk. Some of this was certainly desirable. The pink milk at the end of a bowl of Fruity Pebbles was as close to mana as modern humans could attain. But now all of the cereal has been coated with some type of protective layer that keeps the milk, well, milk. It keeps the crunch in the cereal. All skill has been removed from eating breakfast. The pleasure is no longer there. Where is the fun in that? They've replaced it with a surrogate fun--tiny mouth explosions. That's cheating, and in the long run will leave you unfulfilled. I continue to remain jaded and disenchanted with the cereal industry. Poppin' Pebbles was a fun but empty thrill. I can only speculate on the impact that foods such as this have on society. Are we being short-sighted? Rating as a fun after-school snack to try once: 8.7/10. Rating as a food or breakfast item: 1.8/10. Inside the box is a recipe for Poppin' Pebbles Marshmallow Treats and the solution to the maze on the back of the box. Why was it mentioned on NPR? Is 2.38$ expensive for brand cereal? It sounded like a smaller box. The goldilocksing thing is BIG. That seems like a make or break ratio. Also, I totally feel you when you talk about cereal skills. It takes strategy, experience and cunning to maximize the enjoyment of a bowl of cereal. These days I do not partake as I feel like it's the dog food of people.